Note: Could those who like testing, please check if you have the same conclusion? I can confirm that. If you add them to the database, please don't forget mark them as "Unicode support: No". * The portable version of AllDup doesn't support Windows XP without any Service Pack installed and Microsoft Windows 2000. * The portable Version of GetFoldersize don't support Windows XP without any Service Pack installed and Microsoft Windows 2000. Yeh thanks joby_toss! I forgot to mention that. Though it's a little worrying if someone is using XP without a Service Pack. I had the chance to use a machine which had XP SP1 and found that when I dragged a file into a folder it created a shortcut and didn't move/copy the file. Could you please add a screenshot like this so the users get more info about the program? 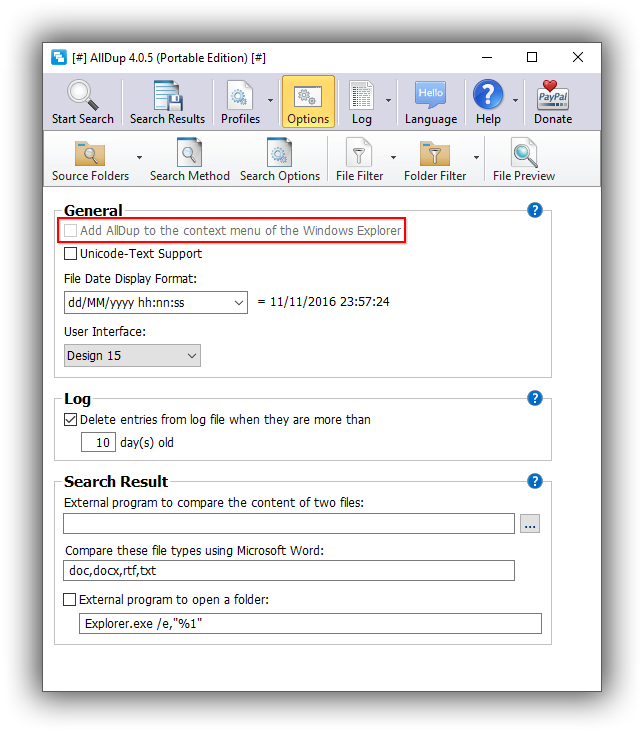 [url]http://www.alldup.de/alldup_help/alldup.htm[/url] author wrote: AllDup is a freeware tool for searching and removing file duplicates on your computer. The fast search algorithm find duplicates of any file type, e.g., text, pictures, music or movies. The powerful search engine enables you to find duplicates with a combination of the following criteria: file name, file extension, file size, file content, last modified date, create date, file attributes and hard links. Last edited by Midas on Thu Dec 28, 2017 7:46 am, edited 1 time in total. NEW: Search Result / Context Menu 'File': Add the command 'Rename file'. UPD: Command-Line: Folder paths without space(s) don't have to be enclosed in double-quotes anymore. UPD: Now you can use the hotkey F4 to start the search for duplicates. 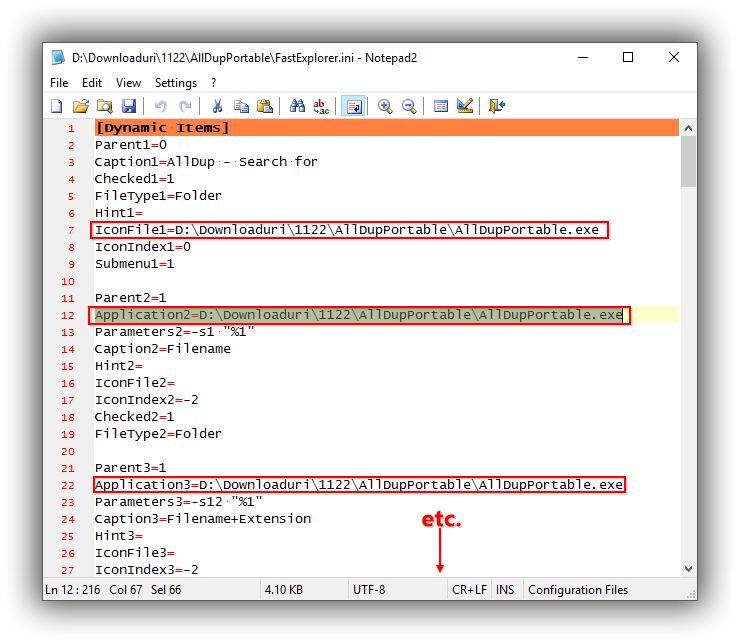 UPD: Profile List, Source Folder List and Search Result List: Now you can use the hotkey F2 to rename items. UPD: Search Result: The created picture preview of a group will be cached until a new group is selected. UPD: Search Result List: Added the columns 'Duplicates' and 'Search Criteria'. (!!! ): The stored search results of the previous version can't be loaded anymore. I am using an older installer version and I have a question- does AllDup Portable offer shell integration? - rename them to "FastExplorer.ini" and "FEShlExt.dll"
Thanks for the thorough write-up! I have an older version installed. I ran the latest portable version and I saw the disabled shell-integration but I thought that my installation might be preventing it. There are portable programs that can be easily added to/removed from shell, so I supposed that this might be the case with AllDup. Your procedure is valuable but I think I will continue with the installed version. For duplicate finders for me shell integration is indispensable. Anyway, AllDup is one of my greatest favourites, I use it daily and for me it is the best of its class. Once again- thank you very much for taking your time to provide such a detailed answer to my question, I appreciate it very much! As mentioned by Specular in the entry's comments, GetFoldersize site redirects to TreeSize comparison page. GetFoldersize belonged to Michael Thummerer Software Design from Chonburi, Thailand (??? ), which also the author(?) of AllDup. TreeSize belongs to JAM Software, which "was founded in 1997 in Trier (Germany) by Joachim Marder"
What happened? JAM Software bought GetFoldersize and killed it? Michael Thummerer = Joachim Marder? Anyway, I linked GetFoldersize to Archive.org, but also wonder, what can possible will happen with AllDup? billon wrote: Anyway, I linked GetFoldersize to Archive.org, but also wonder, what can possible will happen with AllDup? Well I don't see anything in terms of a license restricting redistribution so it should be possible to mirror the download in the event that the site is taken down.